Saturday and Sunday was the celebration weekend for Cinco de Mayo in Southwest Detroit. If you’ve not visited during this celebration, you’re truly missing out on a great time. My Sunday began with a group ride starting at the Wheelhouse Detroit under some stunningly beautiful blue skies. Venerable Detroit ride leader Tom Page led the group down the RiverWalk and into Corktown. Our first stop was at the newest French restaurant, Le Petit Zinc. As Tom noted in a email, it’s a bit ironic that we stopped there given that Cinco de Mayo celebrates Mexico’s defeat of France. We wound our way through to Mexicantown, ending up at Clark Park, home to the big festival. My better half met me for starter food at Taqueria Lupitas, our favorite restaurant in Mexicantown. We then walked through Hubbard Farms, admired the very cool old homes, and over to Clark Park — where we ate more food, listened to the Detroit Youth Symphony, debated seeing the Revolucha wrestling, and otherwise just milled about. What a great benefit it is living so close (and being able to bike) to such a vibrant Mexican-American community – and no swine flu! I ran into Will and Shelley Botens while biking last weekend. We started talking about riding and I agreed to take Will on a tour of Detroit that weekend. We started from Berkley and worked our way over to Oakman Boulevard. The Boulevard took us to our first stop, the incredible Shatila bakery in Dearborn. Biking to bakeries is always a great idea in my mind. Next we went past the Ford Rouge Plant in search of a route onto Fordson Island, which we never found. We headed east, making our way through Mexicantown and Corktown and finally Downtown. Turning south, we rode the Riverwalk and the Dequindre Cut. Will had never been to the Heidelberg Project or Eastern Market, so of course we had to stop by and check them out. Heading north on Russell, we dipped into Hamtramck for a quick refueling at the Cafe 1923 before visiting Hamtramck Disneyland. At this point it was apparent that I had turned this Detroit tour into a very long ride. Never expect a short tour when I’m wearing my IMBA Long Live Long Ride jersey. Last but not least, we had to stop at Theatre Bizarre before making our way up Woodward and back to Berkley. At the end, we’d ridden 61 miles and had a great time. It’s common seeing “customized” signs in Detroit. Most aren’t worth commenting on. However, since it is Earth Day, I thought I’d post this one from North Corktown. I’ll ride in most any weather or conditions. That doesn’t scare me. 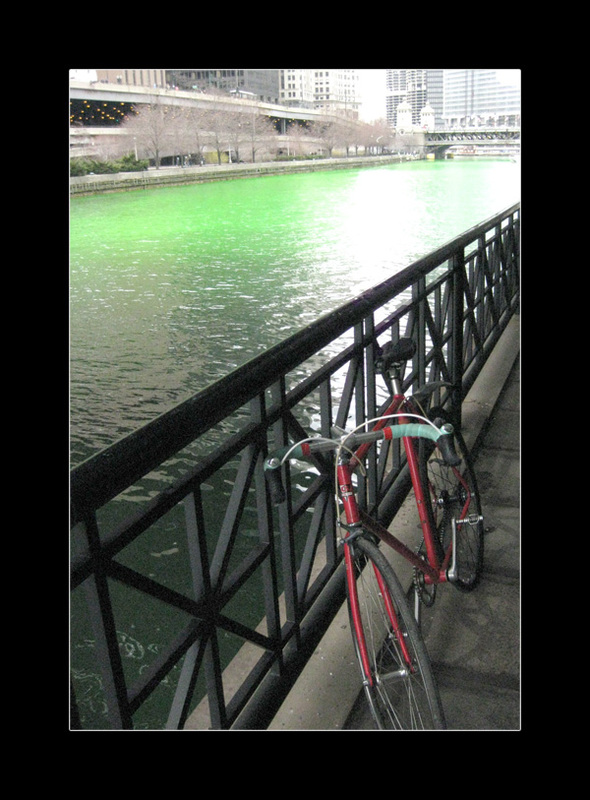 Riding the roads on St. Patrick’s Day and other drinking holidays does. It’s a good time to be extra defensive. This photo of the river is not in Detroit, but Chicago. It was taken by Soupy who recently relocated there. Soupy’s got more cool photos and entries on his blog. While St. Patrick’s Day was celebrated on Saturday in Chicago, Detroit’s Corktown turned green on Sunday. Mike Connolly, Black Eyed Skeez, and I rode down to particpate in the fun. On the way there, I hijacked our ride so we could check out the pygmy goats and other farm animals on Cochrane just north of Old Tiger Stadium. They all came over to greet us, including their kids and a bunch of hens. I’m glad they’re back after being MIA over the winter. This spring I stopped in the neighborhood party store next door and asked about them. The lady behind the glass said the owner had recently stopped in to buy four loaves of bread for the hungry goats. Off the farm, we road over to Michigan Avenue and cheered on the Corktown 4-mile runners, grabbed free snacks from the Mercury Coffee Bar, and found a few spots at Slow’s bike rack — a rack that later became filled. Slow’s was packed. Nemo’s was packed. Even the LJ Lounge was shoulder to shoulder. We also stopped by a friend’s place in the Grinnell lofts. Wow. It was a great place with a very cool outdoor deck on the rooftop. Eventually we got back on our bikes and rode home into the wind. Another holiday in the saddle.